These days it seems like privacy and security are becoming ever more scarce, especially online. If you want any sense of security online, your options are a bit limited: purchase a VPN secured router, or purchase a VPN subscription from a reputable provider and setup your computer to utilize that connection for online security. 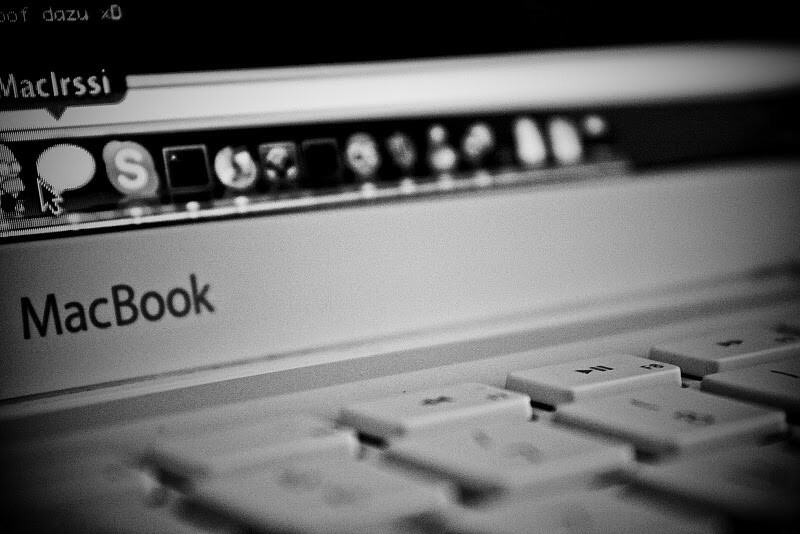 While this gets your computer a secure connection to the internet, the apps only work for specific type of devices, namely laptops and smartphones. If you’re like most people, this author included, you have several devices that access the internet over wifi and you want all of them to benefit from a secure VPN connection. That includes streaming boxes like Roku, Chromecast, and Amazon Fire TV. 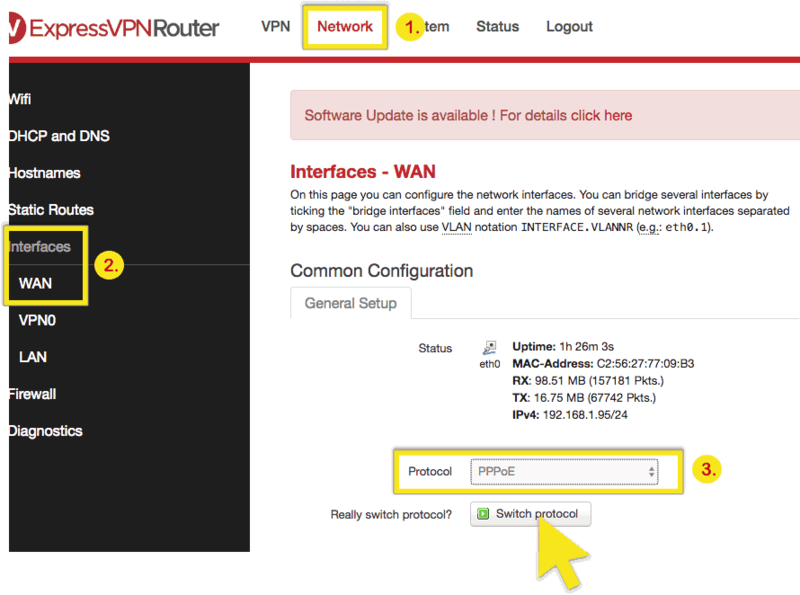 One option is to use a VPN-secured router, like the ones available from ExpressVPN. We recommend ExpressVPN for Chromecast, Roku, and Amazon Fire TV users because of its excellent router support. 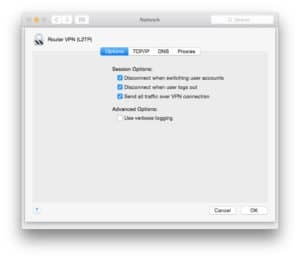 You can flash the ExpressVPN router app onto an existing compatible wifi router, or buy a pre-configured one directly from Express. This is an easy solution and comes with a simple interface for switching servers and controlling other settings. BEST VPN FOR ROUTER SUPPORT:ExpressVPN is A blazing fast and reliable choice. Best in class at unblocking major streaming services and censored content. Comes with top-notch security and privacy features and keeps no logs. Try it risk-free with the 30-day money back guarantee. 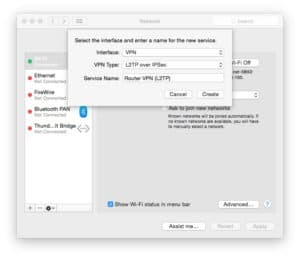 If you don’t want to buy a pre-configured router or you don’t already own one of the routers on this list, keep reading to learn how to configure a virtual router on your Macbook. 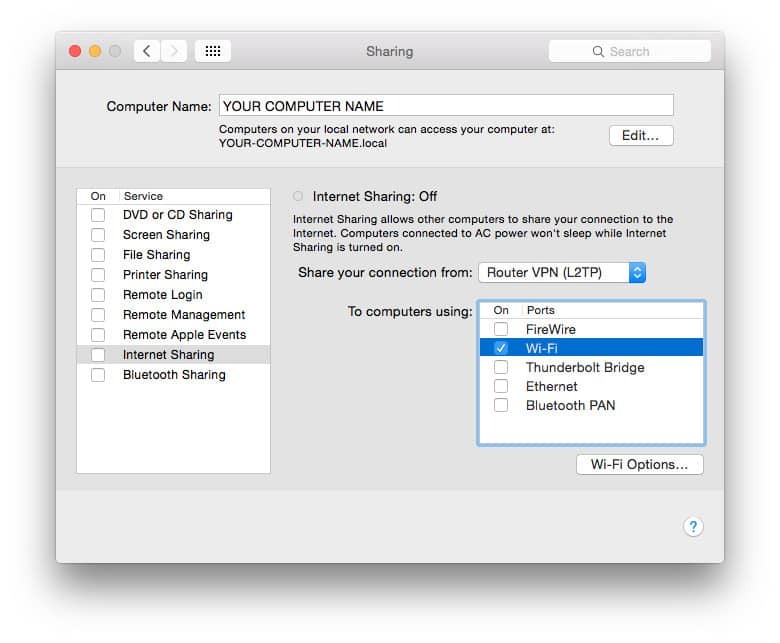 Connect all your devices to the wireless network hosted by your Mac and viola! VPN for all your devices. 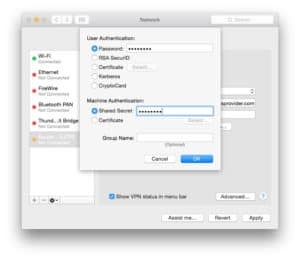 First and foremost, in order to share your Mac’s VPN connection over wifi, you need to connect your Mac to the internet with an ethernet cable freeing it up from the wifi. 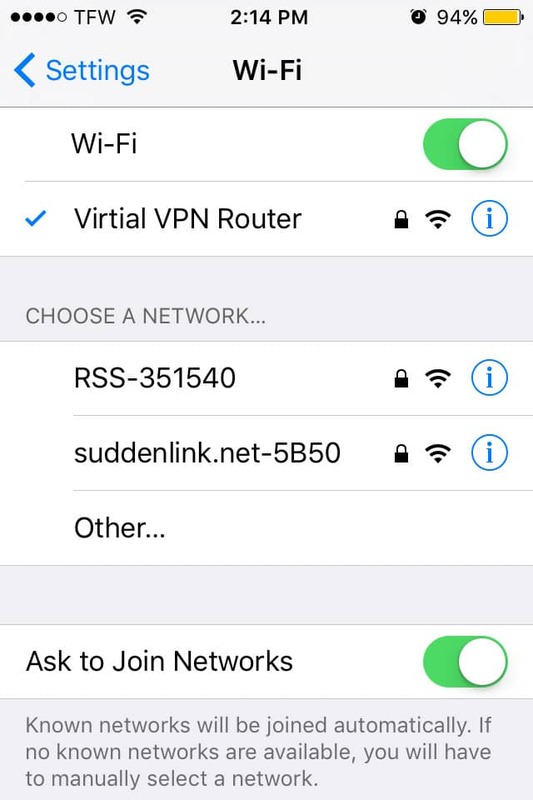 Once you have the cable connected and the wifi disconnected, you can start configuring your VPN secured internet connection. 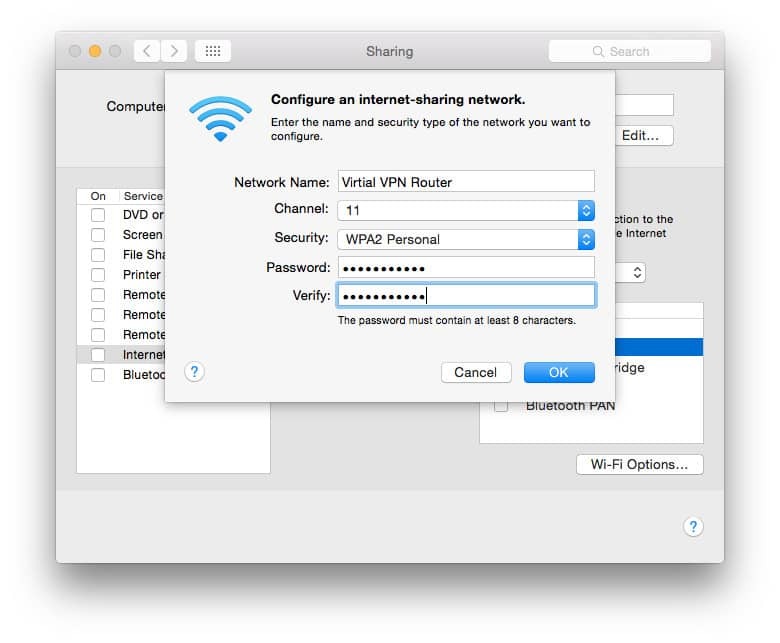 If your VPN provider has a VPN client program, check to see if it has an internet sharing option built in. If they do, follow their instructions for setting up sharing the VPN from your machine. 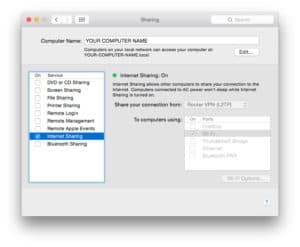 If they don’t offer a Mac client program or one that can be shared, then you can manually configure it as follows. On your Mac screen there is a menu along the top of the screen. You will see a small apple logo in the top left corner of that menu. 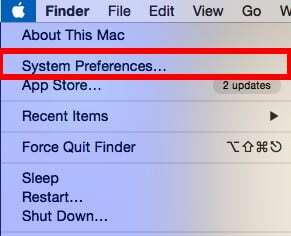 Click on it to get a system menu, then select System Preferences. For these next steps you will need your username, password, and a server address. 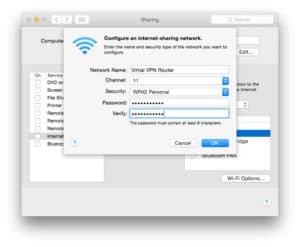 You will probably also need an IPSec key, depending on your VPN provider’s settings, this can also be referred to as a Shared Key or Shared Secret. You can find these under the Manual Configuration section of the VPN provider’s support website. Most providers will also have a list of servers that you can choose from. 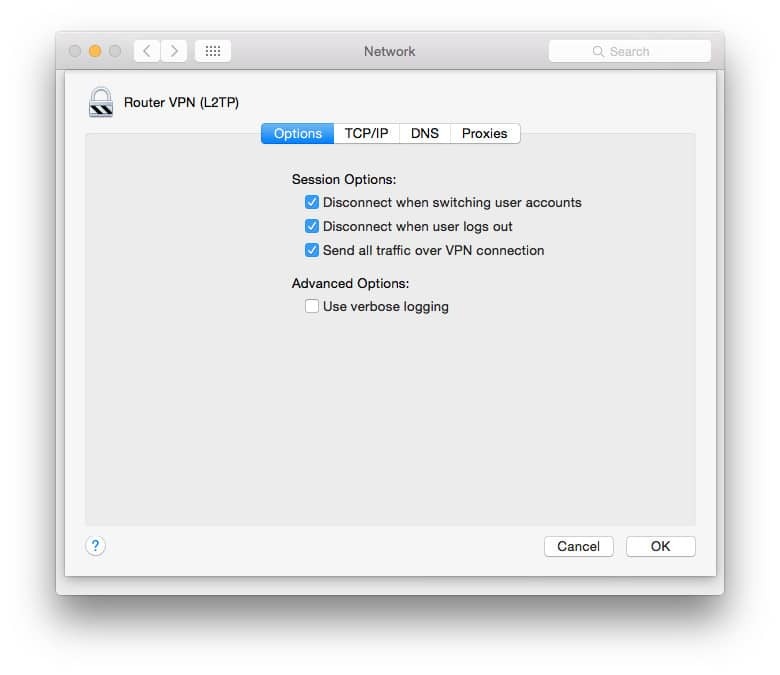 Check the box next to “Show VPN status in menu bar” to see your VPN connection status in the menu bar. 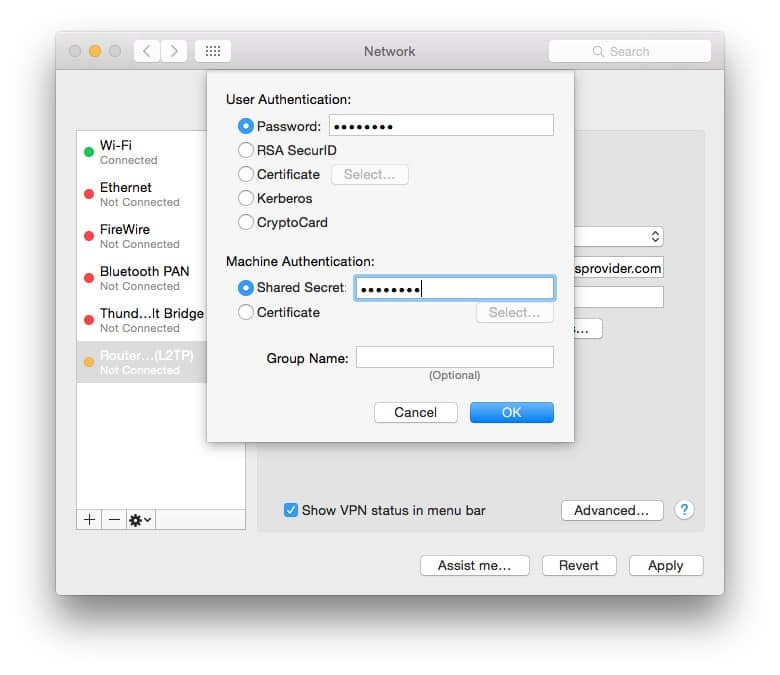 Next, click on Authentication Settings… On the User Authentication screen, enter your password in the box and the IPSec key in the Shared Secret box under Machine Authentication, then click OK.
Next, click on Advanced… Check the box for “Send all traffic over VPN connection”, then click OK.
Click Apply to save all of your settings and then connect to your VPN with the Connect button. You are now connected to a VPN server. Now you just need to set up your VPN for sharing. 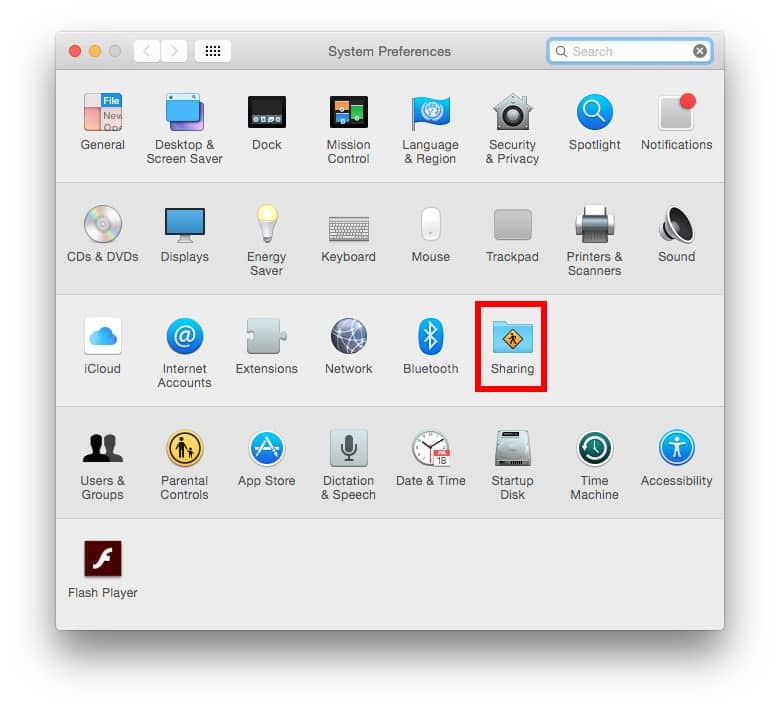 Return to the System Preferences menu, then click on Sharing. Share your connection from: [the VPN PPTP connection you just created]. Next to “To computers using:” check the box for “Wi-Fi”. On the Sharing menu, check the box next to Internet Sharing. You will see a prompt asking you to turn on Internet sharing. Click Start. When Internet Sharing has been activated, a green light will appear next to the text: “Internet Sharing: On”. In your menu bar, you will now see two new icons. The first icon shows your VPN connection status. The other new icon shows your Internet Sharing status. Related: What’s the best VPN for Mac users. 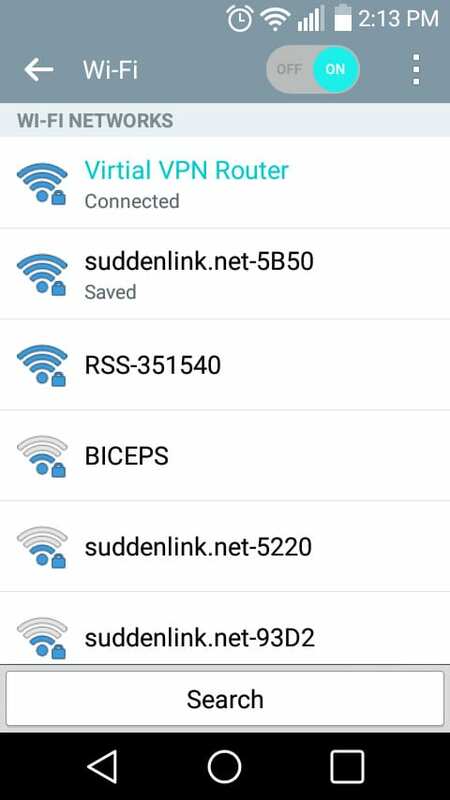 If you select the wifi icon by clicking on it, you will see that it is no longer searching for available wifi signals. Instead it tells you that wifi internet sharing is on. 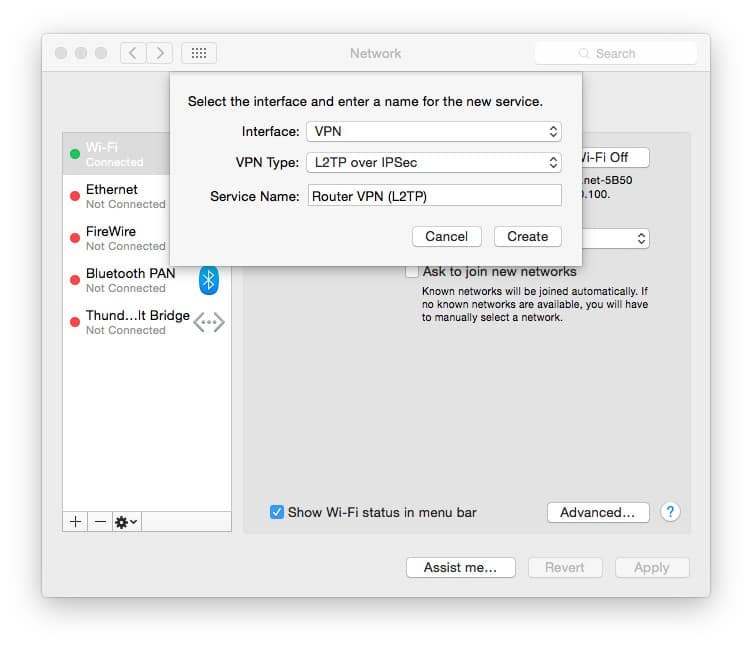 The name of the wifi signal that the Mac is broadcasting–“Virtual VPN Router” in this example–is our SSID and the wifi channel that the signal is utilizing. 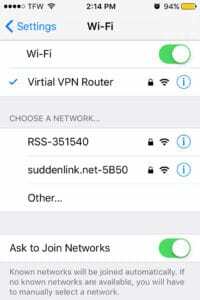 Finally we have a couple devices connected to our “Virtual VPN Router” over wifi, an Android phone and an iPhone. 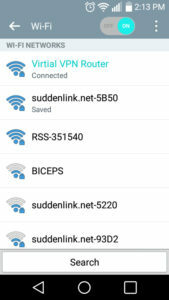 You connect your devices to this wifi router the same way as you would to any other wifi, using the SSID and password that you put into the wifi settings screen above. 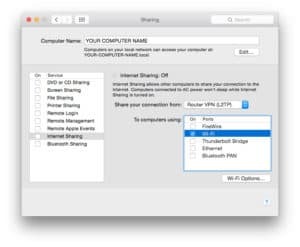 If you should want to stop Internet Sharing, or stop using your Mac as a VPN secured router, simply go back to the System Preferences window and select the Sharing icon again. 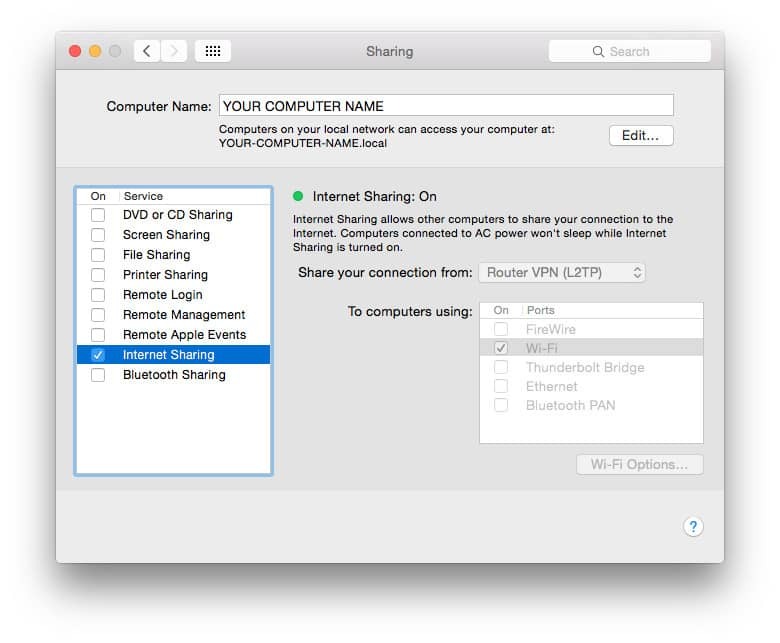 In the sharing window, uncheck the box next to Internet Sharing. 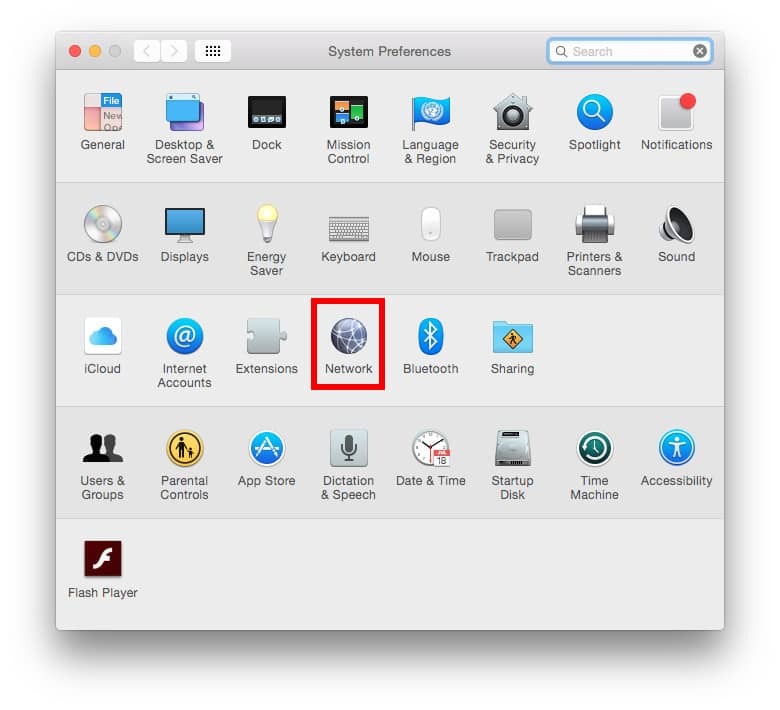 And finally, to disconnect your VPN, go to System Preferences > Network and click the Disconnect button. This setup is pretty basic and it should work for any VPN service. The real test is when you click the Connect button in the Advanced Network settings window. If it is unable to connect, you will want to verify the username, password and especially the IPSec key provided by your VPN service provider. As the VPN server that you are connecting to gets more and more traffic routing through it, all that traffic can get bottlenecked. Be wary of connecting too many devices to your VPN secured wireless network. Start with just a handful of devices and work up from there. If you start to notice any lag, remove any unnecessary devices or try switching your VPN connection over to another server. Leave a comment below and let us know how this worked for you. Also, if you have any requests for any other Mac hacks, pop it in the comments and we’ll see what we can do for you. Enjoy! See also: How to make your own VPN with AWS.